November is here way too soon! 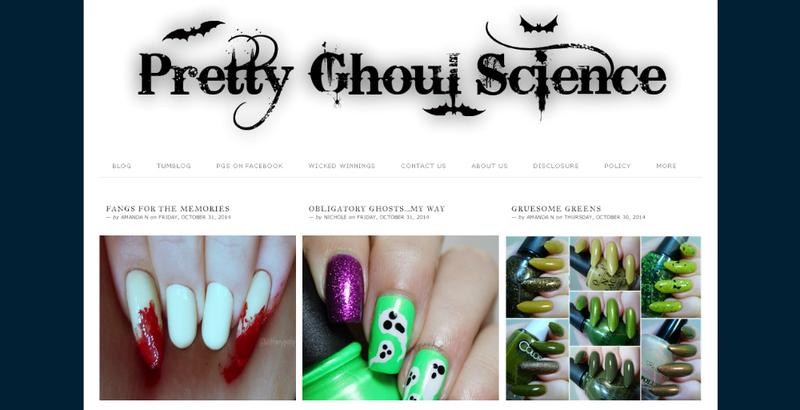 Pretty Ghoul Science is gone for the next eleven months and my stiletto nails went with it. For months people asked me how I could do anything with such long nails, but now that they're gone I'm a fumbling mess. 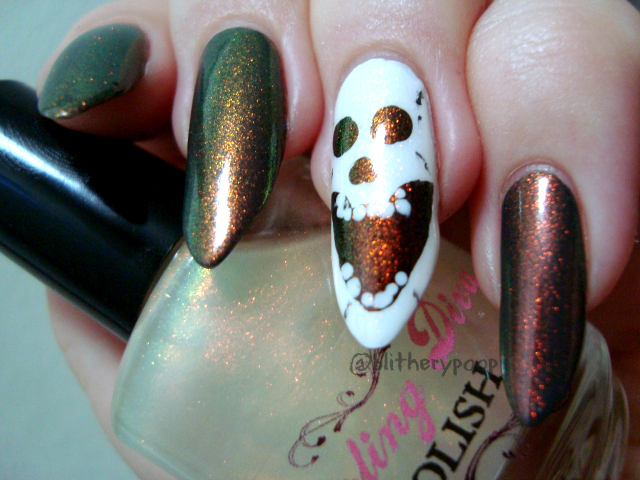 To ease the shock of shortening them so much I did a transitional sorta Day Of The Dead thing for over the weekend. 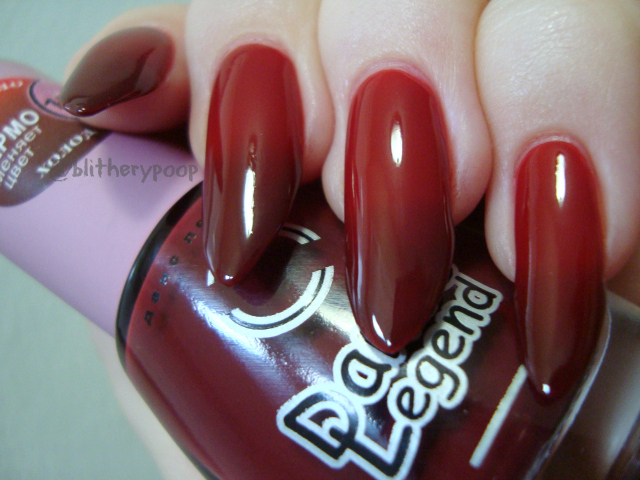 The base is OPI I Don't Give A Rotterdam. I have no clue why I only got around to buying it last month. It's gorgeous! Little on the sheer side and a four-coater, but really pretty and SFW. There was a guy in Rotterdam who...well...it's a long story, but maybe the association with him kept me away from this polish. Who knows? I stamped over IDGaR with Sally Hansen Platinum Star, using the Cheeky Viva Mexico plate. The stamping isn't quite as subtle as I'd hoped, but I feel like I can fudge the rules a little when they're this short. I really like the results and the Beauty Advisor at a local Walgreens was astounded by them. She didn't believe they were my natural nails at first, which is kinda hilarious because people asked that all of the time when I had the stilettos. Didn't expect it that time! We decided we like the background dark, for now at least, so we kept that. I still have a few lingering swatches lying around from last month and now seems as good a time as any to post them. I wore FingerPaints Warm He-Arted as the base for a work mani a couple of weeks ago. It's a favorite, but somehow it's never made it to the blog before. I love its weirdness...and Nichole hates it, of course. It was a gift from a Nail Board friend. I'm still sad that they discontinued it and I might wind up having to track down a second bottle eventually. The formula's good and this is three coats. I topped it with Darling Diva Ringer Goes Blonde. It doesn't have as much oomph over a lighter color like this, but I still loved wiggling my fingers around to watch the green shift. I wound up topping that skull accent thing with RGB too. There's that oomph! Then there's Dance Legend Termo 170. I think my bottle is semi-defective. The "cold" color is supposed to be much darker. The pigment can lose its reactivity if it gets too hot. Serves me right for buying it second-hand, I guess. Maybe I just didn't get it cold enough. It's still kinda cool, though it took four coats to mostly hide my nail line. Blah. My final stiletto swatch started with Sation Miss Emo Shun All. Hate the name, love the color! It's a bit darker in person, with got that same "dark neon" look as Orly Saturated. I'll have to compare them sometime. This is bluer and not as dark, I think. It was the base for my belated swatch of Sinful Colors Cauldron Couture. 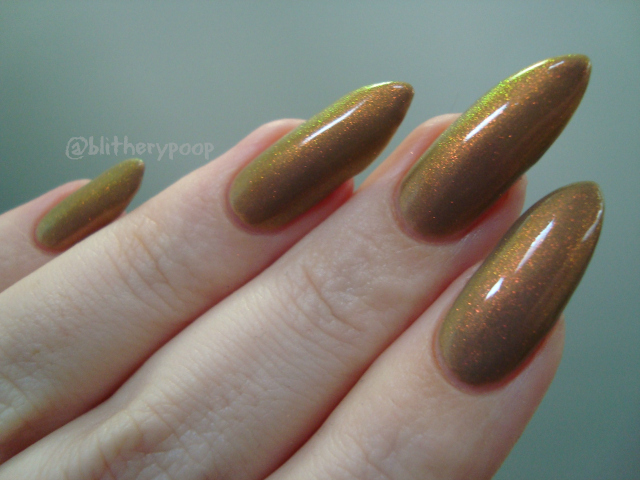 I've added this swatch to my Wicked Color post. So that's that for Halloween '14. Well...almost. There are still a couple of days left to enter the final Wicked Winnings giveaway. Ooh, where do you buy Sation? That's pretty. Oops! I shoulda mentioned that. Ebay. There's a seller who has them for $6-ish.